Owing to the aging population, 60 to 120 percent more elderly people will be cared for in Swiss nursing homes by 2040 than is the case today. Even optimistic assumptions call for 53,000 additional nursing beds. Today, a good 400,000 people aged over 80 live in Switzerland. In 2040, there will be more than 880,000. This development will lead to a sharp increase in the number of elderly people in need of care. If care for the elderly is viewed as a branch of the economy, there is barely any other sector poised for such a dynamic growth in demand that is virtually guaranteed over the long term. Nevertheless, there are challenges to be faced by the largest healthcare sector after hospitals. The financial feasibility of the current system is expected to become even more challenging than at present as the population gradually ages – and the same applies to the training and recruitment of sufficient nursing staff. Although the bulk of the costs of nursing care for the elderly are accrued from staff, significant sums also need to be invested in building new and replacement nursing homes. The strong growth in care needs is set to cause the share of expenditure for nursing homes and ambulant care (Spitex) in gross domestic product to double from 1.7 percent at present to over 3 percent by 2040. It remains questionable as to whether the current financing regime in which not only the health insurance providers and the government, but also the elderly patients in need of care bear the costs is capable of shouldering this massive additional burden. Politicians therefore need to investigate alternative financing models at an early stage and draw up politically acceptable and sustainable solutions – as regardless of whether the financing is secured or not, the demand for nursing and care facilities for the elderly is set to rise enormously in the coming decades. 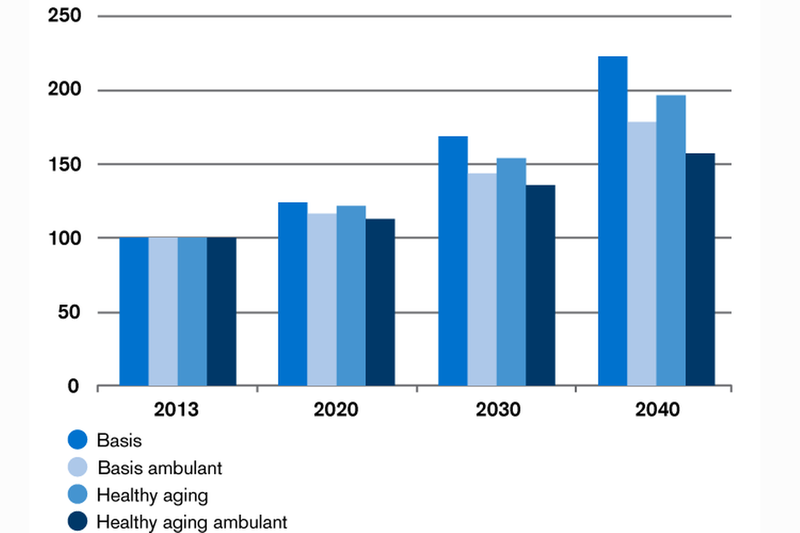 Depending on the given scenario, around 60 to 120 percent more people than today will be cared for in nursing homes in 2040. Moreover, there will be major differences in growth in the individual regions of Switzerland. The demand for care for the elderly is expected to grow particularly dynamically in the most outlying areas of the metropolitan regions of Zurich and Geneva-Lausanne. We generally expect below-average growth in demand in the large towns and peripheral areas of the Jura and Alps. Parallel to demand, the supply of nursing facilities has also grown in recent years. The number of employees in this very labor-intensive sector increased more strongly than in most other branches of the Swiss economy. It therefore comes as little surprise that there is already a partial shortage of skills prevailing today. In view of the continued dynamic growth in demand expected in the future, this is expected to intensify significantly. We expect that by 2040 there will be an additional need at nursing homes alone of 48,000 to 71,000 nursing FTEs, which represents an increase of 1.8 to 2.2 times compared with today. However, the study questions whether this need can be met by a working population that is virtually stagnating. Particularly critical in this context is the acceptance of the mass immigration initiative on February 9, 2014, as over 40 percent of new nursing vacancies have been filled by staff with foreign nursing diplomas since 2006. Today, the 1,500 or so Swiss nursing homes account for around 80 percent of nursing staff. Spitex is responsible for the remaining 20 percent. Ambulant care for the elderly is in future expected to continue to gain in importance compared with inpatient care, not least due to the fact that nursing homes today also house a large number of clients with only minor care needs who from an economic perspective could be more efficiently taken care of by Spitex. However, the strict separation of ambulant and inpatient care is increasingly becoming more relativized. Today, there is already a large number of alternative residential and care concepts such as "living with services" that are undergoing strong growth. 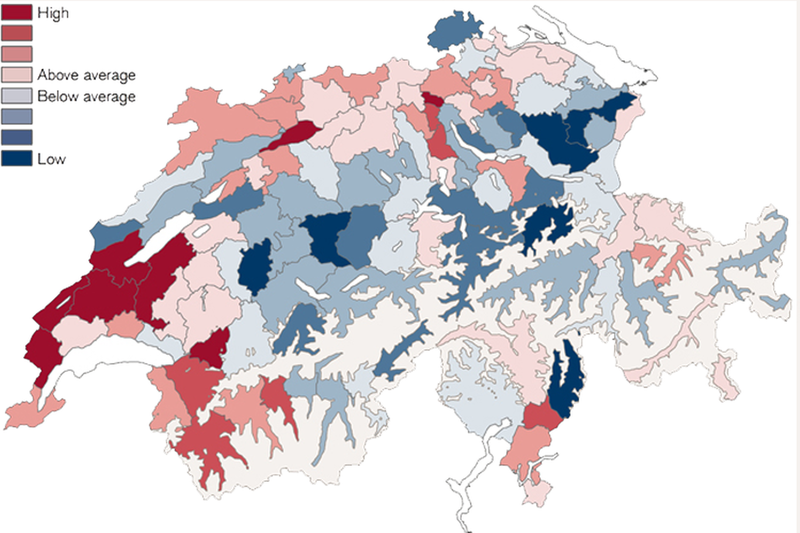 Although the supply of nursing homes is practically unbroken throughout Switzerland – 99 percent of the population can access at least one nursing home within less than 15 minutes' drive – the regional density of supply varies considerably in places. Our calculations show that large parts of Western and Northern Switzerland in particular currently have a below-average supply of nursing beds. However, this finding is partially relativized once the Spitex service is taken into account. Today, the western Swiss cantons in particular rely exceptionally strongly on ambulant care for the elderly. As well as the number of staff, investments in nursing homes have also risen strongly in recent years. While at the turn of the millennium the municipal construction authorities were approving nursing home projects in the amount of some CHF 200 million each year, this figure had increased to over CHF 700 million in the period from 2012 to 2014. Although the number of new construction projects did not go up, the approved properties became increasingly larger. A particularly large number of projects were approved in the Greater Zurich area, the Basel area, and the Mittelland. We therefore expect the greatest expansion in the number of beds to take place in these regions in the next two to three years. The dynamic growth in care properties is set to continue in the medium to long term in view of the forecast rise in demand. We expect an additional 53,000 beds in nursing homes to be required across Switzerland by 2040 despite the increasing importance of Spitex. This is equivalent to an investment sum totaling CHF 18.4 billion – or almost CHF 700 million each year. Neither replacement constructions and renovations nor investments in the construction of new apartments for the elderly are included in this amount. 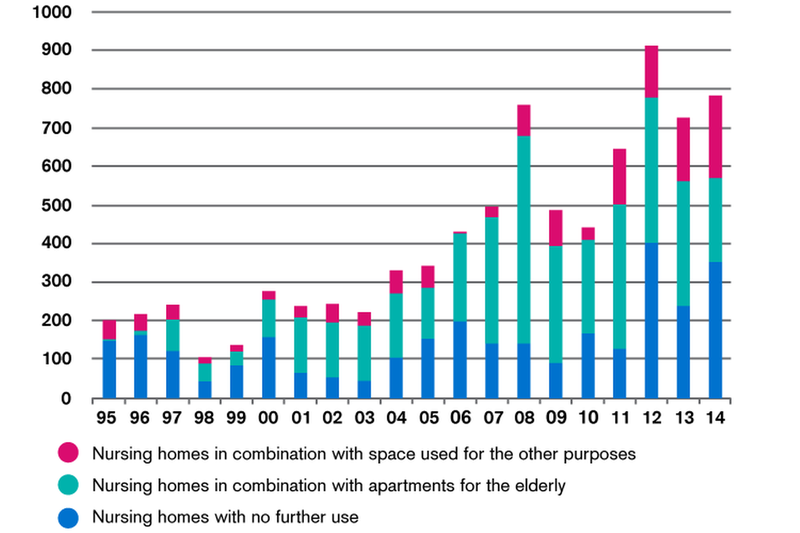 The overall investment volume required for apartments for the elderly and nursing homes can therefore be expected to be significantly higher still. However, the additional need for nursing beds is not spread evenly across Switzerland. Taking into account the forecast growth in demand and the current density of supply, we predict that compared with today above all the regions between Lakes Geneva and Neuchâtel, east of Lake Geneva, and west of the city of Zurich will have to invest in additional beds.